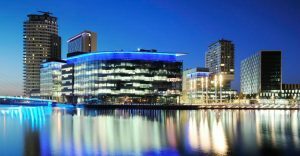 MediaCityUK-based dock10 has handed a regional and corporate PR brief to Rule 5.
dock10, which supplies studios, post production and managed services to the BBC, ITV and a host of independent TV production companies, is looking to grow its customer base beyond the broadcast sector. It is particularly looking to produce more video content, with UK video ad spend having last year grown by over 50% to £711million, according to the Internet Advertising Bureau UK. “Broadcast continues to be our core business but the demand for broadcast quality video content is expanding well beyond traditional TV,” said dock10 CEO Mark Senior. Rule 5 founders Rob Brown and Julie Wilson both have extensive previous experience working for agencies in global advertising networks. dock10’s existing agency Bubble & Squeak will continue to handle broadcast sector PR and is unaffected by the appointment.